The Blue Jays tried to come back but were too far behind the Seattle Mariners, losing 6-3. J.A. Happ started well but eventually allowed five runs in six innings. The Bisons got another outstanding start from a pitcher fresh up to Triple-A but it was a big blast from Edwin Encarnacion that sealed a victory for the Buffalo Bisons. Edwin was 1/4 but the one was a big grand slam in the second inning capping a five-run inning that also included a home run by Cole Gillespie. Kevin Pillar had three hits including a double and Gillespie added a single. Kendall Graveman was excellent, allowing just three hits and a walk with two strikeouts and 11 groundouts (to just two flyouts) over seven innings. The Fisher Cats got big games from several players to beat the Flying Squirrels 8-2. Austin Bibens-Dirkx was much better in this start, going seven innings and allowing both runs (although one was unearned) on three hits (including a home run) and striking out six. Jorge Flores was 3/4 with a double, a run and two RBI while Michael Crouse was 2/3 with two doubles and a walk and Jon Berti was 2/4 with a run, a walk and a stolen base. Starlyn Suriel couldn’t match his last start for the Lugnuts and allowed three runs on nine hits including a home run but he didn’t walk anyone and struck out four. Alonzo Gonzalez allowed the fourth run in three innings on two hits and a walk with three strikeouts. Ian Parmley had three hits while Mitch Nay was 2/4 with a double and an RBI. The Tri-City Dust Devils held out for a victory after getting to starter Zakery Wasilewski for four runs over two innings. Alberto Tirado stranded the bases loaded when he came in in the second inning and was much better, allowing no runs of his own over 2 1/3 innings but walked two batters and struck out only one. Mark Biggs provided three no-hit innings of relief while Andrew Case only walked one over two innings. While the relief pitching kept the Canadians in the game, the offense couldn’t do enough to overcome the four-run deficit. Gunnar Heidt was 2/3 with a double and an RBI and Chris Carlson also had two hits and an RBI. Tim Locastro was 0/2 but was hit by pitches twice and stole two bases. 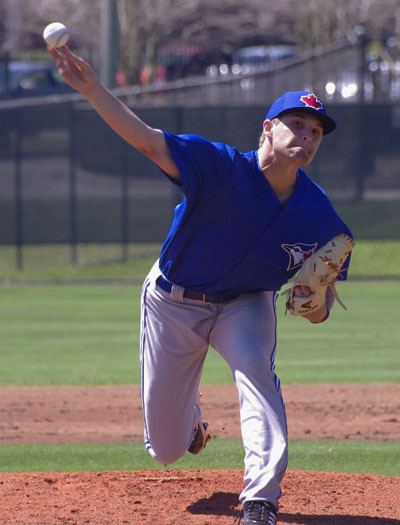 Conner Greene had an outstanding start for the Bluefield Blue Jays, going five innings and allowing just one run on one hit and a walk with eight strikeouts. Conor Fisk was also excellent, allowing just two hits with three strikeouts in three innings. Rowdy Tellez and Jesus Gonzalez were each 2/3 with an RBI. Grayson Huffman continues to have a very good season with the GCL Jays and he added another reason to give him a chance with Bluefield. He went five one-hit innings, striking out four while Francisco Diaz went three no-hit innings, walking two to finish the game. Deiferson Barreto had another two hits, pushing his batting average to .301. The pitching was very good for the DSL Jays with Juliandry Higuera allowing two runs (one earned) on four hits and two walks with four strikeouts while Wilfri Aleton picked up the save with four innings of one-run ball. All of the starters except for Miguel Almonte (who walked twice) had at least one hit while Rodrigo Orozco was 2/5 with a triple, a run and three RBI. Edward Olivares was 2/2 with a double, a walk, two runs and two RBI and Bryan Lizardo drove in two runs with a double and also took a walk, scoring twice. A surging Buffalo Bisons squad faces the Norfolk Tides at home with Sean Nolin on the mound against Miguel Gonzalez, a major league veteran. If I wasn’t drywalling all afternoon, I’d be in Buffalo to catch this one at 7:05 PM ET. It’s also on MiLB TV. P.J. Walters has been sent down from Buffalo to New Hampshire where he’ll start for the Fisher Cats in their 7:05 PM game against the Richmond Flying Squirrels. 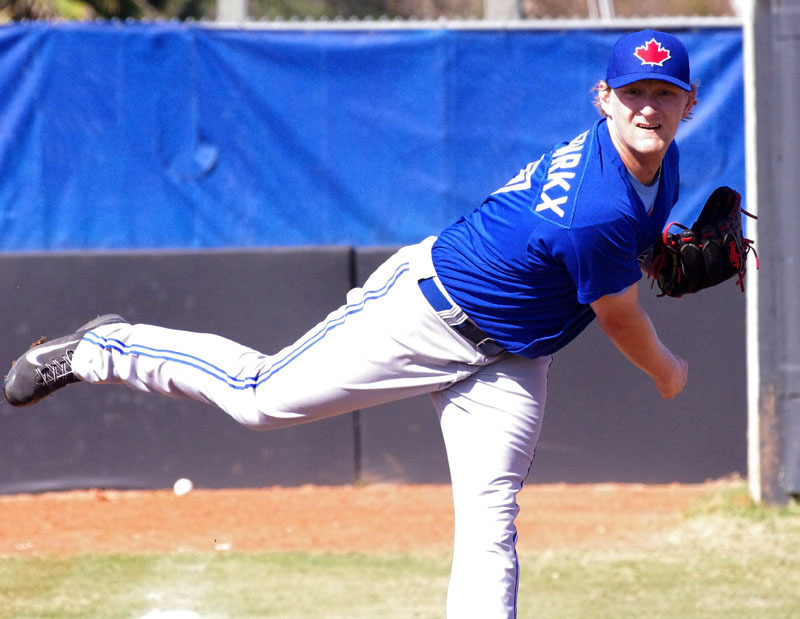 Jesse Hernandez is scheduled to start for the Blue Jays against the Clearwater Threshers at 7:00 PM. The Lugnuts have been coming up just short lately and they’ve got Brent Powers on the mound against the Fort Wayne TinCaps at 7:05 PM at home. Jairo Labourt, who has been outstanding with the Vancouver Canadians this year, starts a home game against the Everett AquaSox at 10:05 PM ET. Jesus Tinoco is on the mound for the Bluefield Blue Jays as they head to nearby Princeton to face the Rays at 7:05 PM. The GCL and DSL Blue Jays are both in action today with the GCL Jays playing a double header against the Yankees1 team.